I have never been a cycling enthusiast. Before I first went to Burning Man in 2007 I’d barely ridden a bike since my adolescent BMX. But one of the many awesome things about cycling in Amsterdam is that you don’t have to be an enthusiast. The only thing better than a great public transport system is one you barely have to use, and this is one of the foremost advantages to living and working in Amsterdam. Even though as a city it has everything, it’s geographically small enough that everywhere you’d want to go is within a twenty minute cycling radius of the city centre. It’s so easy, convenient and safe you’d be crazy to not have a bike as your main mode of transport. I wouldn’t know a chainring from a seat post, so take my advice with a grain of salt. I’m just sharing what I’ve learned about buying and riding a bike in Amsterdam over the last three months. Firstly, for regular city riding, you want an “omafiets” or “granny bike"—single gear and back brakes. Amsterdam really is so flat that gears are unnecessary and frankly a bit of a pain in stop-start city traffic. Similarly, back brakes are simple, low maintenance and avoid another cable which would otherwise snag in the nest of bikes you’ll find yourself parking in. A big padded seat and upright riding position make for comfort and a rack on the front for a crate of beer will make you friends that you can then dink on the rack on the back. If you want a really cheap one you can get something serviceable like the above from the Waterlooplein markets with front and rear lights and a chain included for €80, but don’t do that. I did, twice, and it’s a bad idea for two reasons: firstly, when you look closer you’ll see that an €80 Omafiets is cobbled together out of spray painted rust and hope and eventually parts will get loose and wobbly and you don’t want to deal with that while fanging it down Vijzelstraat post-borrel. The second reason to spend more is that cheap locks don’t. I locked my two-week old bike in front of a café and sat down to wait for a fellow Appsterdamer to arrive; while doing so I saw someone take a bright red chain off a generic-looking omafiets and thought to myself, "That’s a really bright red chain, kind of like mine” as he casually rode off. Half an hour later when I went to get on my bike to leave, I believe I may have said a rude word. You have to pay at least €40 to get a lock worth buying. The problem with really cheap locks is there are only about a dozen possible keys for each model and they’re easily defeated. But that’s still not enough. You need two: a chain AND a wheel lock on the back wheel. These are quick to lock and unlock and operable with one hand, but using one by itself is inviting a long walk home. Or, in my case, since my second bike was locked only with a €15 wheel lock when it was stolen from outside my house one night, a long walk to wherever I had to go the next morning. I managed to hang on to that one for a whole week. Not that I’m bitter or anything. So, a chain through the frame and wheel and around something that terminates a foot into concrete, plus a wheel lock on the back wheel are necessary to ensure your steed stays where you left it. If a thief wants your bike they’re still going to defeat both of those in a minute, but if they just want a bike they’ll look for something that’ll only take thirty seconds. A sucker’s bike like either of mine, for instance. “I don’t have to outrun it, I just have to outrun you”. This is the main reason I’d never buy an €80 omafiets again. I’d feel stupid spending the same amount on locks as I did the bike. Might as well spend €200 all up and get something more solid and reliable. Get front and rear lights for riding at night or in the (plentiful!) rain. These are more for visibility than as headlights, so you don’t need anything fancy. Simple (cheap!) battery operated LED lights are better than dynamos as they’re consistently bright, have no wires to snag and don’t sap any of your pedal power. Not having done it (well, aside from the prei in the back rack of the first bike I had nicked—yes, really! ), next time I would seriously consider getting a can of electric pink spray paint and pimping my bike. This has two advantages: it makes it easier to find in a thicket of generic black omafietsen and the more distinctive it is, the less likely it is to be stolen. … a bell. Or air horn. No, LRAD. Possibly a sidewinder missile mounted to the front forks. By far the biggest hazard you will encounter as a cyclist in Amsterdam are the neverending supply of fresh tourists wandering into the bike lanes. You can tell how long they’ve been in town by their reaction upon hearing a bike bell. If they’ve only been there a day they will remain totally oblivious. If they’ve been there a week they’ll jump like they’ve been stung, possibly into oncoming traffic. I didn’t manage to hit anyone while I was there but came close a number of times, especially coming down Damrak/Rokin, cycling past the Heineken brewery and around the intersections near the Rijksmuseum and the Vondelpark. Just be aware around popular areas and if all else fails, shout “Get out of zee bike lane, you silly tourists!” (in the manner and accent of a French taunt) and you’ll be OK.
Next most hazardous are tourists on bikes. Typically not regular cyclists or familiar with Amsterdam and sometimes even not used to riding on the right hand side of the road, they can be unpredictable and get in the way. Fortunately they’re easy to recognise as they’ll be riding a modern step-through style bike (not an omafiets) in red with “Mac Bike” written on the front. Keep your distance or give them a polite “notification ding” and they’ll pull to the right and allow you to pass. You have nothing to fear from the local riders. If you do something silly, they’ll overtake glaring at you, shake their head and go on with their mobile phone conversation without the bar fridge perched in their front rack even wobbling. 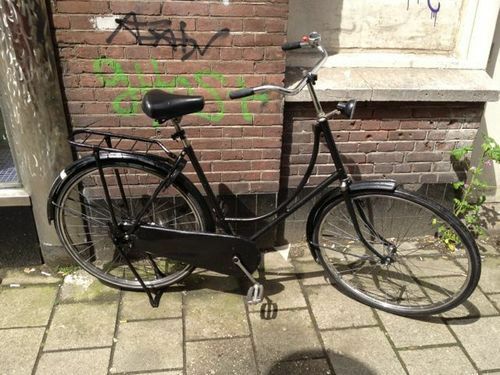 The absolute last thing you have to worry about riding in Amsterdam is motor vehicles. Drivers know that any collision between a car and a bike is assumed to be their fault and the subsequent fine or criminal proceedings will ruin their life and they behave accordingly. So, that’s what I’ve learned about biking in Amsterdam: don’t cheap out too much (especially on the locks), lock the damn thing properly, customise for fun and bicycle retention, watch out for the tourists and have fun riding around the most practical cycling city in the world.